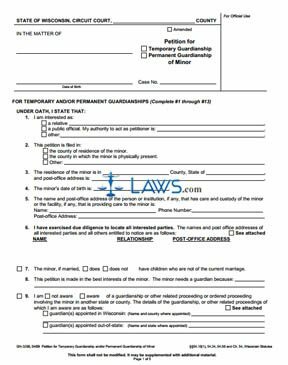 This form must be filed in the Circuit Court of the county the minor has residence, currently resides, or another county if approved by the court. Parts 1 through 5 are self-explanatory and easy to fill out. In part 6, provide the name, relationship to the minor, and the post-office address of all other interested parties that need notice. Check the appropriate box in part 7. State a reason why the guardianship meets the best interests of the child in part 8. In part 9, state if there are any other proceedings for guardianship or a related case involving the minor and provide any necessary information. In part 10, only provide the name, address, and phone number for the guardian set forth by the petition. Check the box and explain why below if one or both parents have not been chosen as guardian. In part 11, check at least the first two boxes. In part 12, provide the estimated values of the minor’s real property, personal property, and other benefits. Check the appropriate boxes. If petitioning for permanent guardianship, parts 14 through 16 need checked and filled in appropriately. If the guardian is asking for a specific power, the box on the far left MUST be checked. Choosing only the first or second box will have no effect if the box on the left is not checked. In part 15, the first box needs checked if petitioning for guardian of the estate. Check the additional boxes if necessary. Parts 17 through 22 are for temporary guardianship. Check all boxes that apply. If there is a box that says “see attached” on the right-hand side of a section, an additional form is required along with the petition if the section was completed. After completing this form and any other necessary forms, the petitioner needs sign and notarize the form.